This is another little creation for baby Lila. It's still a bit big on her but it should serve her well through the summer and perhaps into next year too. I had planned some bloomers but I have set those aside for now. Sewing gremlins arrived in my sewing room as I started work on those. I love the big bows on the backs of these dresses. 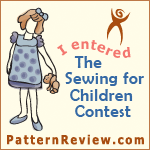 I saw a tutorial on one where the placket was cut into the dress. I thought that was sort of unnecessary since there is a seam already. I just turned the seam to the back and used it for the placket. I'll make another soon with some fabric I picked up yesterday and do a quick tute. I like the larger tie to keep them from falling off her shoulders. I really wanted to applique a bunny on the front. But the bunny wasn't cooperating. Besides it would kind of limit to Spring wearing. I opted instead for these parasols that were on the Children's Corner website. I had pinned them some time ago and thought they would be perfect. These are much, much smaller than called for, but the dress is so small. Because they were so small, I wasn't able to stitch the other two lines required. It just looked wonky. I hope I'll get around to the bloomers at some point before next year so she'll have at least another year to wear it.